I've seen forums discussing the latest Batman vs Superman movie and have read paragraphs on which one of the two is better. Well, for some I buy the point that Superman is better; but Batman is clearly a common man (though rich) who has come a long way to build himself a superpower rather than being born with one. The argument can go on and on and still there might be no conclusion to this debate, but both are meant for one purpose - saving the human race. Yet, there are some key differences in the way both these men operate and to put things into perspective, I will cite the example of the Mahindra TUV300 and the Ford EcoSport. Now, I know that both these vehicles aren't meant to save the human race, but just like the two superheroes, they have their similarities and differences. The Mahindra TUV300 gets more, in terms of dimensions, cabin space and even seating capacity, when compared to the Ford EcoSport. The EcoSport wins the battle of power and, to an extent, even design. 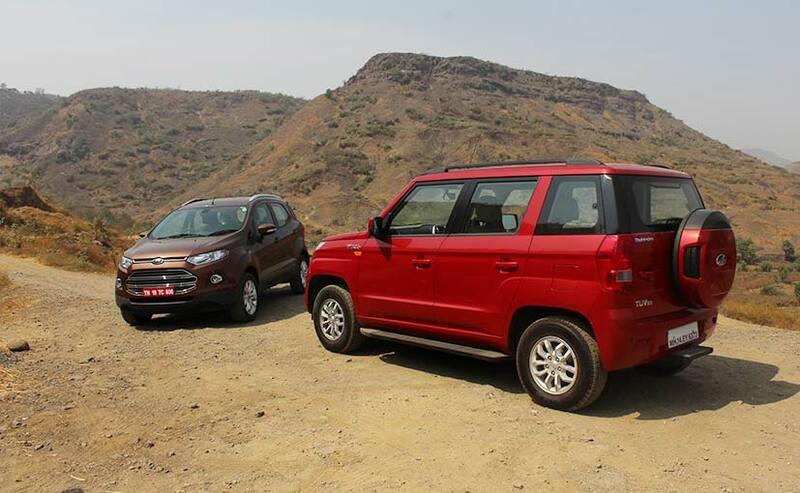 Both come from two different worlds too - as the EcoSport is underpinned by a monocoque chassis, so everything is one wholesome unit; while the TUV300 is built on the rugged ladder-frame chassis, which, according to the folks at Mahindra, maintains its SUV DNA. However, both the cars have something in common - they're both sub-compact SUVs and fall into a similar price bracket, which makes this battle an interesting one. Though the TUV300 is the new kid on the block, Ford has given the EcoSport a mild update; still, it isn't as robust looking as the Mahindra. Moreover, you can't really take away the great performance and driving dynamics the EcoSport has to offer. So, clearly there isn't an outright winner here and that's why we drove both the cars to find out more. 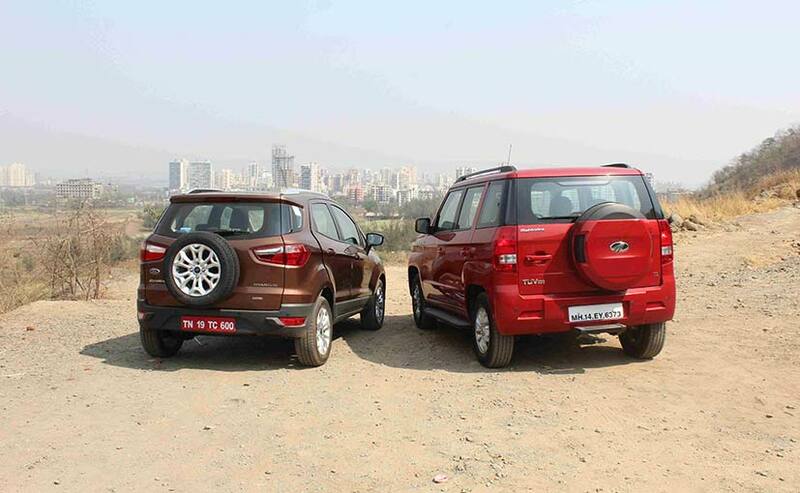 The Mahindra TUV300 is bigger than the EcoSport. This is not only visible to the naked eye; but also if you go through the dimensions. You can see it's bigger and this translates into more space in the cabin. There's more legroom on offer, in both the first and second rows. You also sit on a pedestal, with a clear view of the road, while in the EcoSport it's more like you're sitting in a sedan. But what the Ford offers is a comfortable seat and there's good thigh support, as compared to the TUV300, so you're comfortable and absolutely at ease, when inside the car. 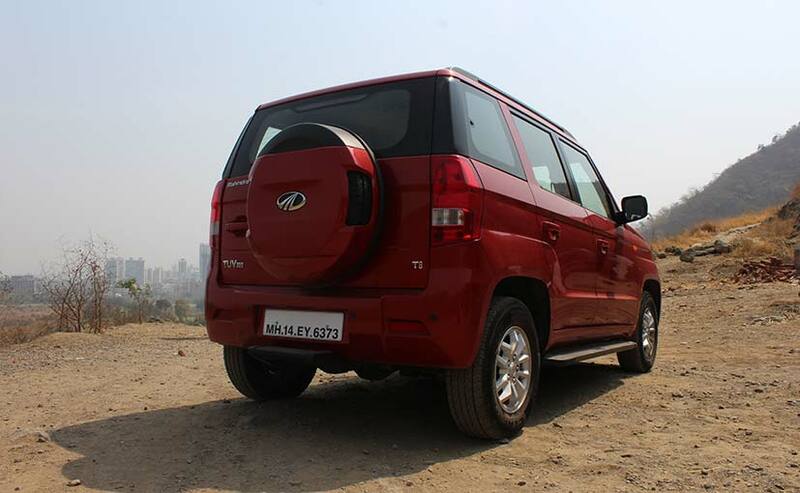 When it comes to seating capacity too, the TUV300 outshines the EcoSport, in a big way. 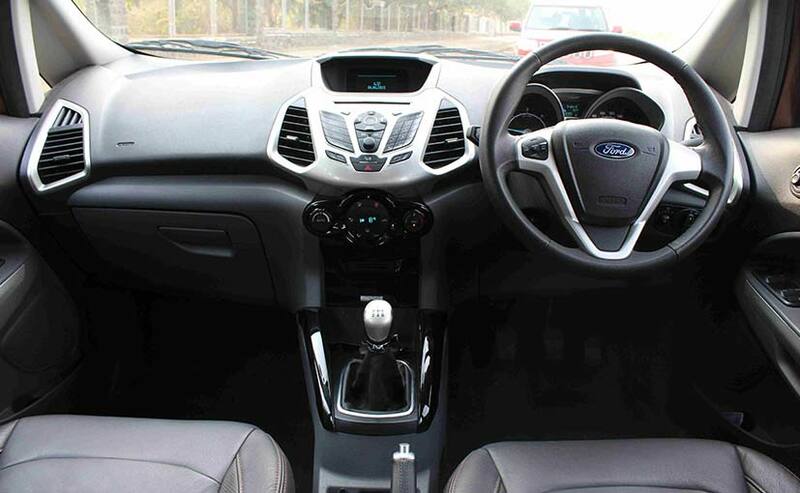 There are 7 seats on offer, as compared to 5 in the EcoSport. Mind you, the two jump seats at the rear are not the most comfortable and you sit really close to the door, which isn't really safe (I am thinking rear collisions here) and there aren't any seat belts, at the back, either. As far as features are concerned, both cars come with the usual packaging - Bluetooth, USB and even Aux-In. 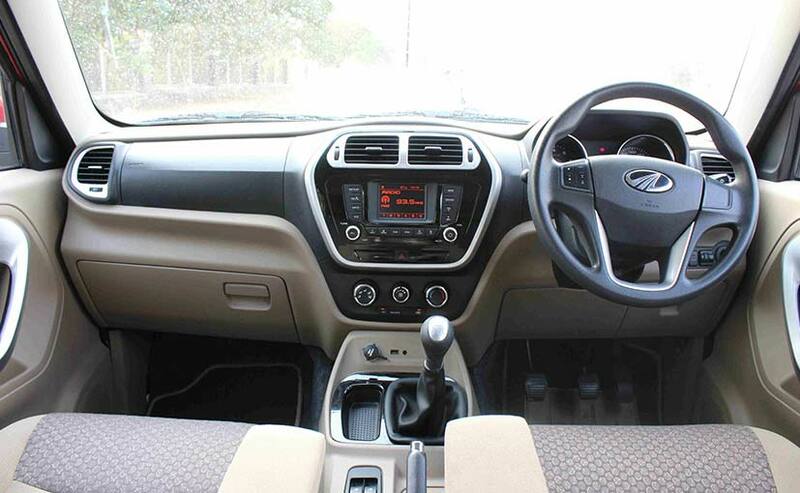 The EcoSport, however, is well equipped in terms of features and gets more of them than the TUV300. There's the SYNC system, which comes with voice commands, and then there is also the Emergency Assistance and App-link. You get automatic climate control and yes the EcoSport is more expensive than the TUV 300, but even the trim just below the Titanium+ (top-end) variant comes with more equipment than the T8 variant of the TUV300. 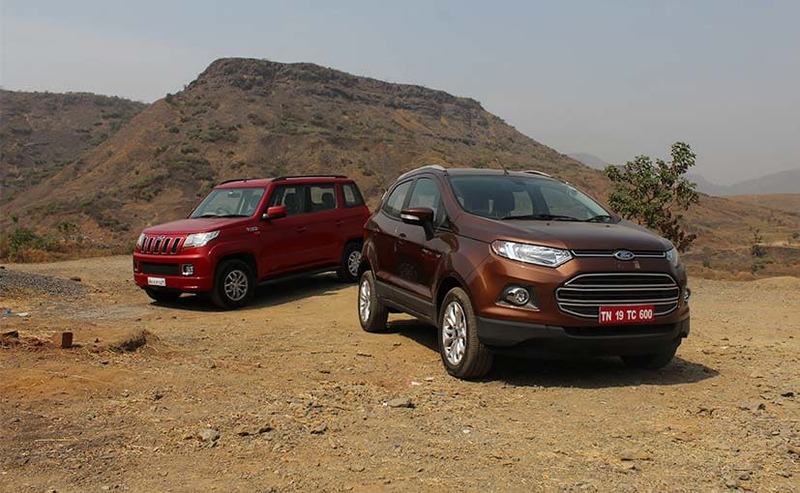 Going on to the engines then, both the cars are equipped with 1.5-litre diesel engines, but the one, in the EcoSport, has 4 cylinders; whereas the TUV300 makes do with just 3. The EcoSport also comes with 99bhp at your disposal; compared to 84bhp in the TUV300; but the latter has more torque on offer - 230Nm as compared to 205Nm, in the former. The EcoSport of course is the faster of the two, there's more power on offer and it's lighter than the TUV300 and that makes a lot of difference, in the way it drives. The power in the TUV300 is available from as low as 1350rpm and with a larger power band and shorter gear ratios, the TUV is actually a pretty nice car to drive, as you have to deal with less of gear changes and you can happily put it in the third gear and pull from 20km/h to about 80km/h. You'd love to take the EcoSport around a corner, because that is when you feel the car working as a unit; and you feel you're driving a sedan, rather than an SUV. The TUV300, on the other hand, has higher profile tyres and doesn't really like corners. The body roll is evident and it's happy to roll on, in a straight line. The suspension setup on the TUV300 is on the softer side and at lower speeds absorbs the undulations and potholes, on the road. The EcoSport, however, gets a harder suspension setting and that's why at lower speeds, it thrashes around a bit, when dealing with a pothole, but the ride gets better, as you speed up. At the end of the day, though, it all comes down to the price of the cars. The EcoSport Titanium model, which we drove, comes priced at ₹ 9.99 lakh, while the TUV300 T8 variant comes with a price tag of ₹ 8.61 lakh (both prices ex-showroom Delhi). 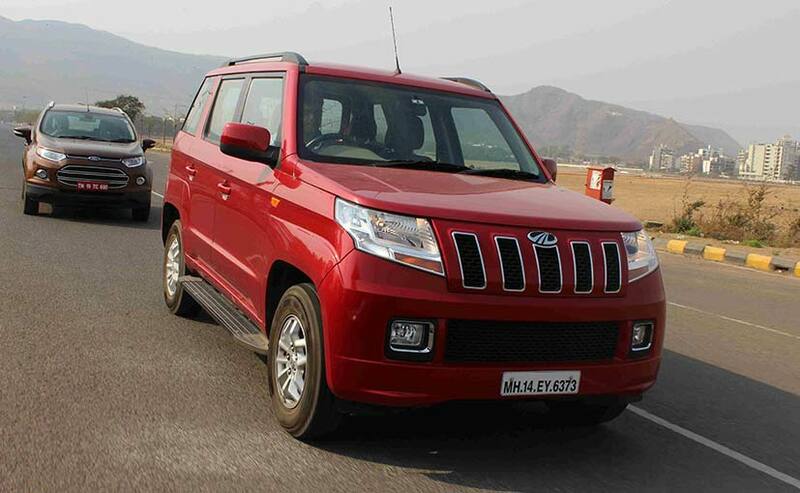 So, yes, the difference between the two is more than a lakh and clearly, Mahindra's TUV300 has the edge, as it's spacious, seats more people, is more SUV-ish and cheaper. So, is it the winner then? Well, not really. The Ecosport might not be a value proposition, but it's better on fuel efficiency, has more features and drives more like a car, than an SUV, and is essentially the fun car (of the two) to drive as also better on build quality too. 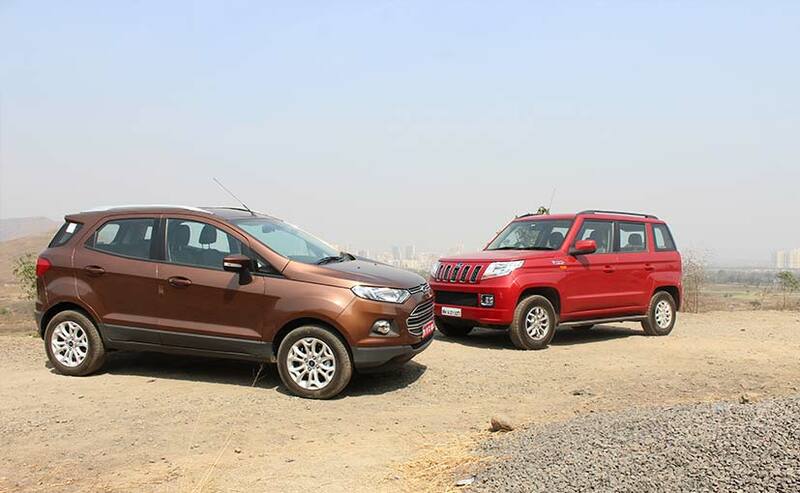 You might not be able to choose between your superheroes, but the EcoSport wins this battle. Mind you, if you are looking for a car that will fit your big family, then the TUV300 is the one to go for. However, the competition in this segment is getting even better, with Maruti Suzuki fielding the Brezza soon and Hyundai getting into the groove, to introduce its sub-4 metre SUV, by 2018. There's a lot more coming your way, so brace yourself!